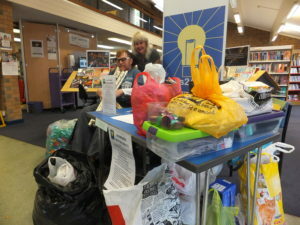 The first Wimborne Win on Waste held on 14 October at Wimborne Library during the Care for our Common Home Minster Eco Event was a huge success with 82 people either donating or making enquiries about the next one on 6 January. Seven good causes have been helped with the items which included milk bottle tops, biscuit wrappers, stamps, cleaning product items, ring pulls, printer ink cartridges, biros/pens and wrapping paper. This entry was posted in Latest News, Win on Waste - Wimbore on October 16, 2017 by Monique Munroe.